Here are some good reasons to choose T-Rex® when you install your new gutters. Your gutter is out of shape. 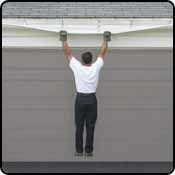 Do you know the risk of a gutter bending under the weight of a ladder or tree branch? The look of your home will be deteriorated in a short while! Your gutter is clogged. 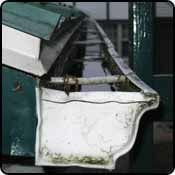 Water overflows and seeps between the gutter and the fascia board. The board will eventually start to rot and may even spread rot to the soffit. Your gutter is weak. It cannot support the weight of debris, water or snow. Your gutter is no longer functional. It is dangerous for your home. It’s one of those jobs where you’re groaning even before you take the ladder out of the garage. 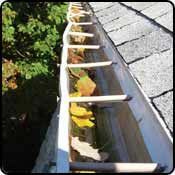 Leaves, sticks, bugs and twigs all do their part to clog your gutters, leaving your house vulnerable to damage. Your gutter does not work anymore. 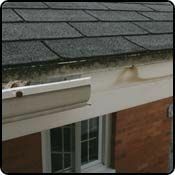 The overflow caused by buildup of leaves and residue has clogged your gutter. With standing water, the risk of West Nile virus is higher. Your gutter is totally clogged. Protect your biggest investment, your home. 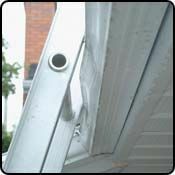 Install the Alu-Rex products to avoid problems with clogged gutters. 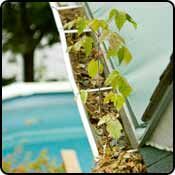 Got Gutters has the solutions to these unfortunate problems.